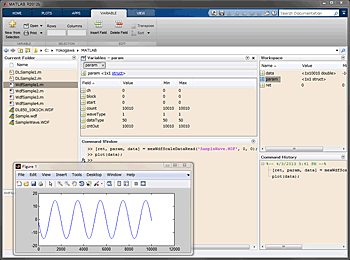 This MATLAB tool kit enables DL and SL series instruments to easily interface with MATLAB. The software can be used to transfer data from DL and SL series instruments to MATLAB via GP-IB, USB or Ethernet. MATLAB tool kit (Model: 701991) ver. 2.40 released. When you install this software program, the MEX-Functions for WDF files are installed. 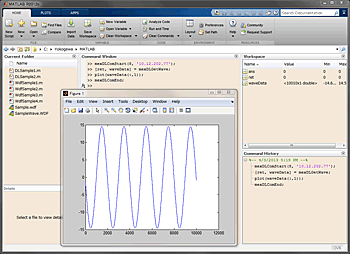 The MEX-Functions for WDF files enables MATLAB-characteristic dialog-based programming. 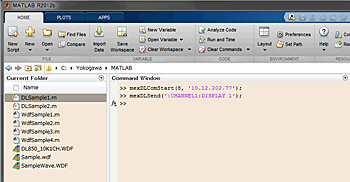 The followings are examples of using the MATLAB command window and the MEX-Functions for WDF files in m files. Retrieves the measured data and plot them. Sends a message to the device (DL). The device (DL) can be controlled remotely. Also, a data can be received from the device (DL) and imported into MATLAB. Gets the specified channel and physical value block data from the specified WDF file. The MATLAB tool kit supports the following models. The mexDLControl command, which starts the DL control window, is not available on and after the Matlab tool kit (701991) version 2.00. Please use Xviewer or Xwirepuller free sotware instead. The Xviewer and/or Xwirepuller cannot be used together with the MEX-Functions for DL control.